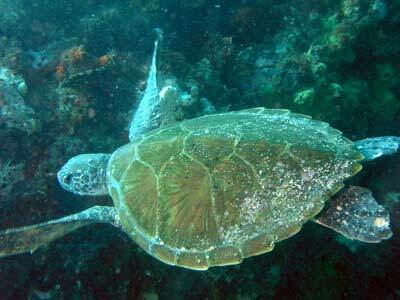 Michael McFadyen's Scuba Diving - Green Island At South West Rocks on the mid-North Coast of New South Wales, the main dive attraction is Fish Rock and its spectacular Cave. On the way out to Fish Rock you pass some of the North Coast's most historic and attractive coastline. First you cross the picturesque Horseshoe Bay and the wide expanse of Main Beach. Next you see the Arakoon Gaol at Trial Bay. The ruins of the gaol can be visited and are the site of a former criminal prison and, during World War I, a German internment camp where people of German descent were "imprisoned". This is not really the right term as they were free to do anything but leave the immediate Trial Bay area. After passing Arakoon you turn south and go by the beaches of Little Bay (there are at least three in NSW!) and then Gap Beach in Hat Head National Park. Just south of this beach is Green Island. It is only a few dozen metres from the mainland to the island but it is virtually impossible to do as a shore dive due to the length from the nearest car access and the steep access. In fine seas, the dive boats sometimes pass through this channel on the way to and from Fish Rock. The main diving at Green Island is on the northern and eastern side of the island. South West Rocks Dive Centre has a mooring on the north-west corner of the island. The water depth here is about 15 metres. A very low reef extends back to the east and then south as it rounds the island. It gets a bit more prominent as it goes and the depth goes down to 16 or 17 metres on the sand. 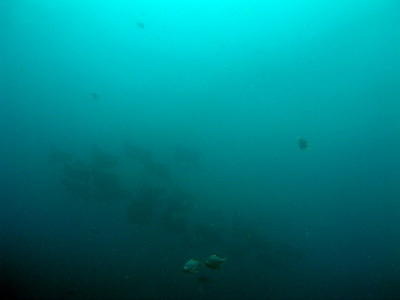 The reef consists of low reef and small rocks with a sand edge. Towards the south-eastern corner the reef gets much more shear and there are a couple of narrow gutters and quite a few overhangs. Once you enter the water, head east along the sand edge. 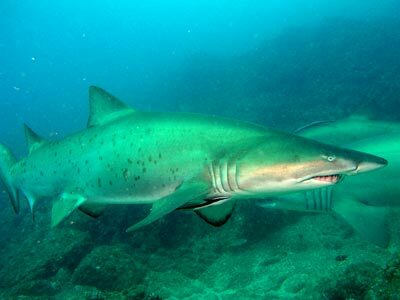 Green Island is one of the congregation sites for grey nurse sharks and you are almost certain to see some at the right time of the year. 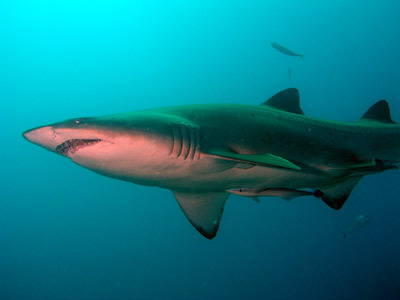 The sharks are most common during Winter and Spring. The sharks seem to hang around the area between the mooring and the north-corner and the area south of this. Once you reach the corner, head south. As you go, zig-zag a bit and you will see more. In this area, I counted 20 sharks in September 2007 and my wife, Kelly, counted 30. I estimate that there had to be at least 40 to 50 at Green Island on this day. Keep going south till you see the sand edge join a vertical wall. You can go a bit past here, but this is about as far as it is worth going on most dives. See comments at the end of the article about at least one of the sharks we saw that day. When returning back to the mooring, stay a bit west and follow the wall. It is less prominent further along but it is easy to follow. In good visibility you can see the island shore above you. As you go along here, check all the cracks and overhangs, there are normally some turtles in this area. Once back at the mooring, go west for a bit till the shear slope from the island hits the sand. From here return to the mooring area and spend any remaining time in the shallows between the mooring and the island. 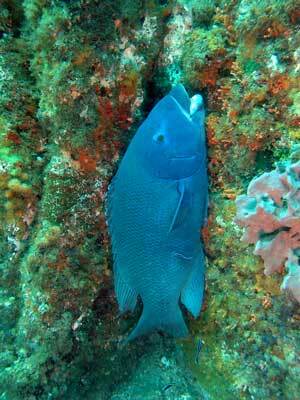 The fishlife here can be quite prolific, especially on the eastern and south-eastern sides of the island. As well as turtles, you can see fiddler rays, bream, leatherjackets of many species, different wrasses, sand whiting, firefish and the more common fish, sometimes in huge numbers. On dives here on the last day of 1996 and the first day of 1997 we saw two large loggerhead turtles that are resident in the Green Island area, dozens of very large drummer, hundreds of bream of quite good size, a giant dusky flathead, thousands of yellowtail, large schools of blue morwong and luderick as well as dozens of free-swimming eastern blackfish. In June 1999 I saw about six or so grey nurse sharks, a couple of small turtles, many fiddler rays, huge schools of bream and other fantastic fish. You can also do this dive as a drift, either from the mooring on the northern side to the point off the southern end in the normal current or the opposite if the current is from the south. I have also gone all the way around the island (in fact 1.75 times) on one dive when we had no current. Normally the visibility here is not as good as Fish Rock, averaging 15 metres, but I have had visibility of up to 30 metres. It is generally more affected by big seas due to its shallow depth. Nevertheless, Green Island is a very good second dive and at times when sharks are present in large numbers, an outstanding dive. When diving South West Rocks, I recommend South West Rock Dive Centre. Contact them on 02 6566 6474. 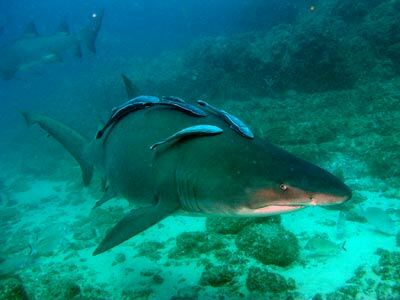 Since about 2005, Carley Bansemer of the Queensland Moreton Bay Marine Park has been doing her PhD on trying to identify grey nurse sharks by using the spots and marks on their sides. I, along with some other people, have been sending her CDs of photographs of all grey nurse sharks that we see. The advantages of working out a system and then keeping it up to date is that you can get a better idea of the number of sharks as well as where each one travels. She has now proceeded to a point where she can identify a lot of the sharks as being seen in different locations at different times. 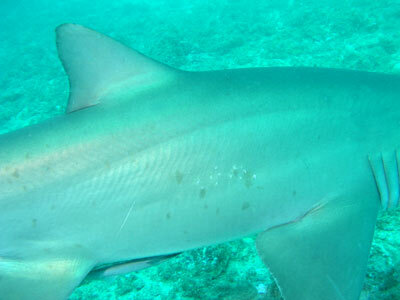 After my September 2007 trip to Green Island, Carley advised me that seven of the sharks that I photographed she had been able to link to sharks photographed elsewhere. 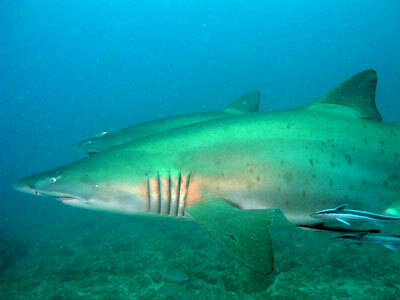 One shark, 416/418 (represents both sides of the same shark) had been photographed by Damien Siviero at Jervis Bay on 29 April 2006. This is the shark in the photograph at right. 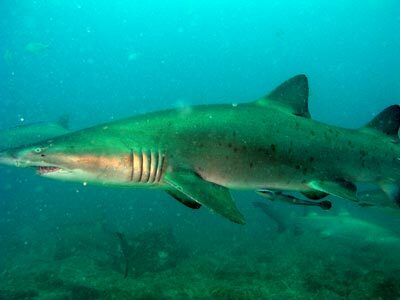 With a bit of luck and help from other divers, this may end up as a fantastic resource to help protect grey nurse sharks.